"We have TOO many Gods!" is how a friend, an Indian, once explained to me the size of the Hindu pantheon. 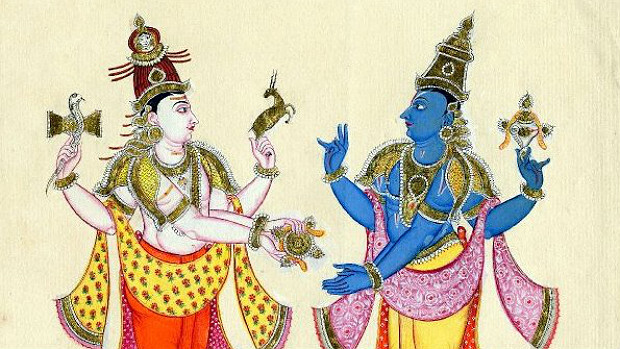 On another occasion, he explained that the various incarnations of Vishnu have "TOO many hands!" Over time, I was impressed that his intended meaning was not what I would mean by "too many", but rather something like what I would mean by "so many", a positive or neutral judgment of number rather than a negative judgment. This impression was reinforced as he elaborated on the natures and lives of the many Gods and pronounced with pride that: "we have TOO many Gods, and we all get along fine!" There are TOO many Gods! Understand that as you will, as a positive or negative judgment. In either case, there are TOO many Gods. Do we get along fine? Perhaps we need a place, like the Hindu pantheon, for our Gods to meet, discuss, fight and party together? Oh, you sly devil, you just want to kill the whole bunch of them: God is dead? The Pantheon is dead! Olympus just went up in a mushroom cloud ... but I can hear the whispering of your resurrected God: "And the Lord went before them by day in a pillar of a cloud, to lead them the way; and by night in a pillar of fire, to give them light; to go by day and night".